I was in a summer poetry class taught by Kate Green in the Split Rock Arts Program in 1985 when I first read a poem by Leslie Scalapino. I kept confusing it and calling it The Split Arts Rock Program. The poems were in an anthology called 19 New American Poets of the Golden Gate edited by Phillip Dow. Of all the poets I read for the first time there—Jack Gilbert, Kathleen Fraser, Robert Hass, Linda Gregg, Jorie Graham, and others—it was Leslie Scalapino’s Considering how exaggerated music is that captured me as a phrase. It was my first year in the real world. 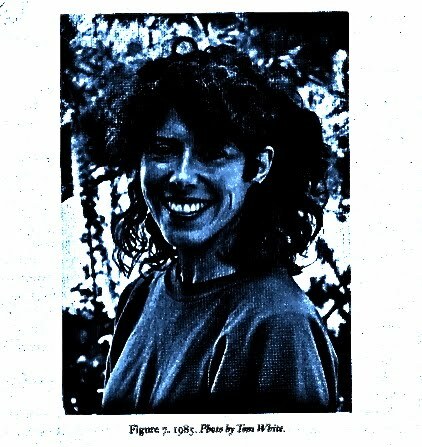 I lived with a somewhat older man—an experimental composer, musician, and mathematics librarian—and worked as a bookkeeper at a holistic veterinary clinic in Madison. Before I returned from my one-week stay in Duluth, a week he had spent camping alone on the north shore of Lake Superior, he called the dorm from a telephone pole in the woods and described the multiple varieties of moths at night. I quoted Scalapino: “considering how exaggerated music is, considering how exaggerated music is” as if it were a feminist one-liner, one we both liked immediately. Later we drove to Woodland Pattern in Milwaukee, and I found three books to change my life: Scalapino’s that they were at the beach, Linda Gregg’s Too Bright to See, and Jane Bowles’ Two Serious Ladies. That summer and because of those books I became a short story writer. I became a short story writer instead of continuing as a poet when I saw that Scalapino called her glinting narratives poems. 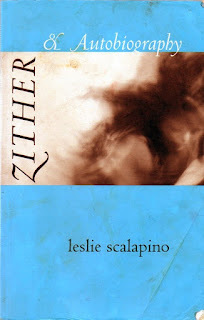 […] I took the opportunity in 2008 to hear Leslie Scalapino read at Dixon Place, but I left abruptly after the reading when I might have eaten with her in a group. I wanted my adoration for her writing to stay pure, on a plane of writing, where it had started; I talked back at it—at shyness and mentor love—as I walked home. When she died last week, I could not have predicted it, did not know she had been ill, felt a rush of sadness that came out as tears for someone I had read and seen yet not met, whose writing is the most original and truly contemporary of any—until then—living writer—I had read. Scalapino approached the novel as Mina Loy approached poetry. The most literary writers resist memoir. Perhaps they think of it as commercial. Perhaps that is what Scalapino thought when she pitched her Autobiography[i] to Gale Research. She wrote the memoir for a month (mid-October to mid-November of 1997) for a $1,000 payment “as if the wage for a month’s writing.” After at first accepting the memoir, Joyce Nakamura of Gale Research rejected it because “It is too esoteric and not what our readers would expect. I mean I can appreciate the stream-of-consciousness and all—but this is going to be in libraries!” (50). Wesleyan published it in 2003. Writing that classifies humor is rarely funny, rarely captures what James Robison describes as humor’s sacredness. In Autobiography, Scalapino writes, “Later, knowing it was manner of ‘extreme’ emotion of crying, I asked my father They were laughing? He said No, it appears to be the same but they were expressing grief. I took note interiorly later also that they were demonstrating strong emotion for a little girl. This indicated a difference between what people said occurs at all [in society] and what occurs in fact” (3). Where will innovative writers, not more cautious than she but less assuming in caution, go without her guide? To her books a laughing and crying muscle declension. [i]All quotations are from “Autobiography” in Zither & Autobiography, by Leslie Scalapino (Middletown, CT: Wesleyan University Press, 2003). 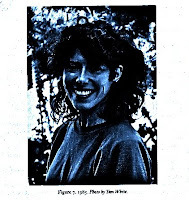 PHOTO (above): Leslie Scalapino, 1985, taken by Tom White, reproduced in Autobiography as Figure 7. Ann Bogle's short stories appear this month in Metazen and Istanbul Literary Review. 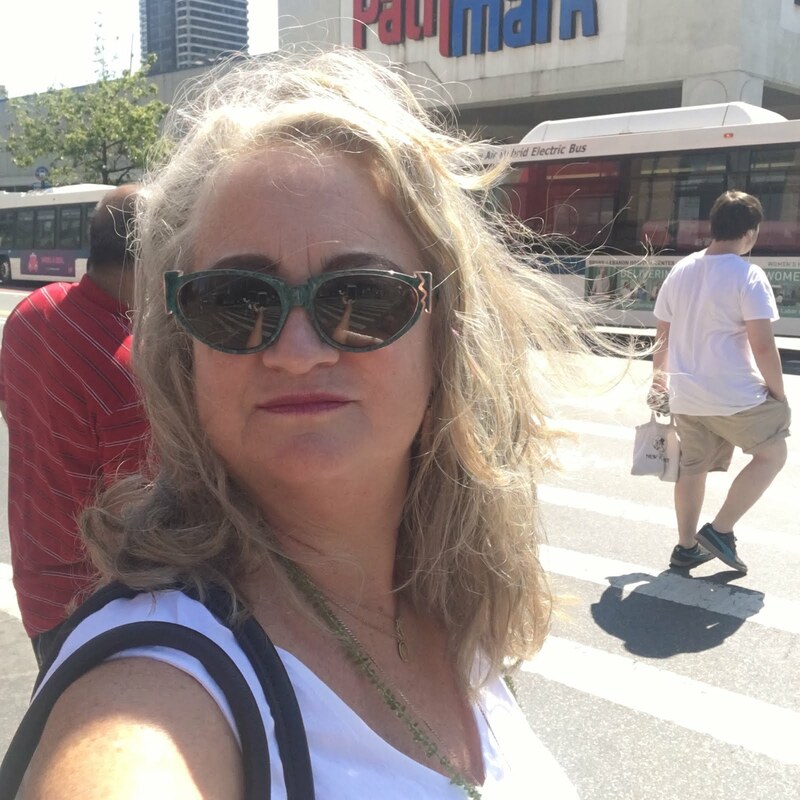 Her stories have appeared in The Quarterly, Fiction International, Gulf Coast, Black Ice, Mad Hatters' Review, Big Bridge, and other journals. 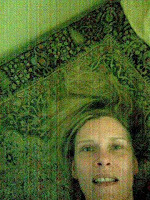 She is the author of XAM: Paragraph Series (Xexoxial Editions, 2005) and dog barks up a tree at the apple left in it under a deerslim moon (Orium Press for the Dusie Kollektiv, 2009). She blogs at Ana Verse.